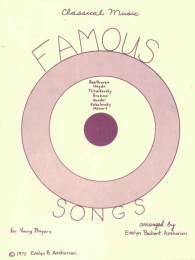 By (Evelyn B. Avsharian) - Famous Songs for Young Players. Short themes from well-known classics for the beginner. Features Beethoven's Ode to Joy, Tchaikovsky's Russian Dance, Kabalevsky's The Clown, etc. Oversize notes.